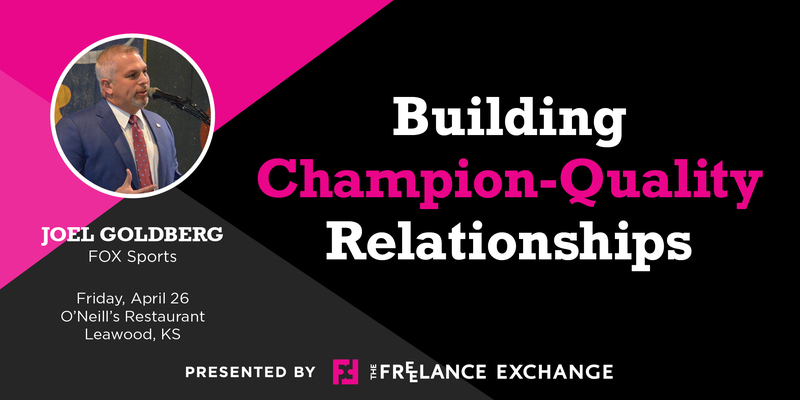 Creating and sustaining relationships is at the heart of any freelance practice, so who better to hear from about relationship building than Joel Goldberg of FOX Sports? Though you likely know him from The Kansas City Royals—and the Salvy Splash following victories—he’s a bit of a freelancer himself. His experience includes broadcasting for the UMKC Kangaroos men’s basketball team, college hockey and other sports; he’s currently the play-by-play announcer for the Kansas City Mavericks hockey team. Additionally, he has a rapidly growing audience for his Rounding the Bases podcast, and speaks frequently to corporate and nonprofit clients about the importance of organizational culture. Originally from suburban Philadelphia and Chicago, Joel has a J-School degree from the University of Wisconsin-Madison and covered the St. Louis Cardinals baseball team for FOX Sports Midwest before coming to Kansas City in 2008. His 25-year career in broadcasting includes covering multiple sporting events, and he’s established contacts in virtually every corner of Major League Baseball. So, join us for an informative session featuring Joel Goldberg about establishing, growing and sustaining relationships in a multi-client practice, whether your clients are highly visible or under the radar. Friday, April 26th 11:30 a.m. -1 p.m. Presentation and lunch begin at noon. Register by 11 p.m., Wednesday, April 24, 2019.